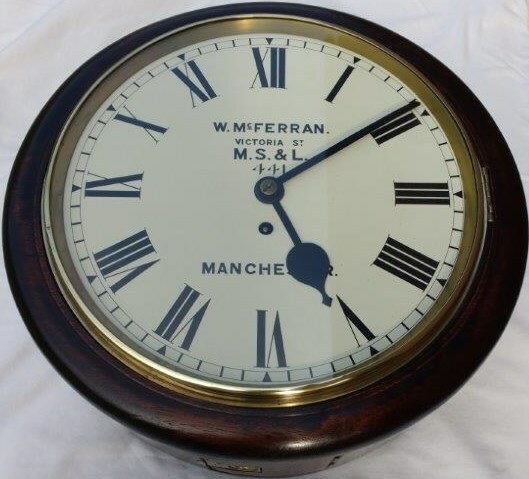 Lot 143 RAILWAY CLOCK - Manchester Sheffield and Lincolnshire Railway - Mahogany cased 12" Fusee movement dial clock- INSCRIBED "M.S.L - W. McFERRAN - VICTORIA ST - No 441 - MANCHESTER". Rear of dial marked "GUIDE BRIDGE and other location include "Sheffield Victoria". The back box has one side door and one lower door. Complete with pendulum and key. A GOOD EXAMPLE OF EXCEPTIONAL QUALTIY. A RARE CLOCK. Full working order.